Those of us on the cutting edge of innovative discovery (see what I did there?) need to collaborate with people from diverse backgrounds and disciplines. Many times we face having to choose between two or more viable paths for design and development. While everyone always cheerfully gets along during the “no input is bad input” brainstorming phase, there comes a time when members need to get on board with one idea to pursue. The decision to pursue that idea can be lucrative for those who came up with it. This is where you get some groupstorming. It is natural and normal for some team members to play the role of “devil’s advocate”, maybe it’s personal, maybe you’ve tasked them with that role. Either way you need to be able to spot illogical arguments against a great idea. 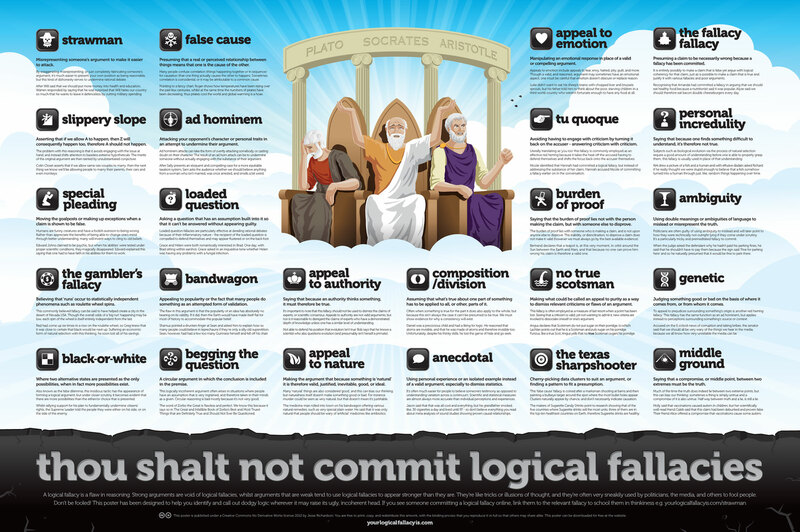 Our good friends at http://www.yourlogicalfallicyis.com, Jesse Richardson, Andy Smith, and Som Meaden have posted this great poster along with links to each logical fallacy. Each one is defined and has a handy example to better help frame them. You can print out your own .pdf poster or buy a high quality wall poster from them for $20. When you read through them you will spot some that you probably will admit to yourself that you utilize for different arguments in your life. And that’s a good thing!